If you’ve been following along on this renovation journey (#ourcornercottagereno over on Instagram), then you might recall that this view above used to be the dining room. If you would like to see the “before & during” pictures of the whole house, head on over to THIS blog post. My vision for this space was a combination of several styles, I guess. I really wanted the kitchen to feel calm and serene when I walked in, and no one style did that for me. I created a vision board at the onset of the project and then just went with my gut. I drew a lot inspiration from the 18th century Shakers. Their motto was simplicity and functionality, and I am always striving for more of both of those in my life. The original wood floors were salvaged, and new, matching hardwoods were feathered in. It’s not perfect, but it’s that touch of wabi-sabi goodness I was going for. We refinished the floors with Woca Wood Care products (I talked about that more in THIS post), and it gave the floors a very light and natural finish - which I adore. You’ll see that I chose a very simple wood knob to go on all of the drawers and doors. You would not believe the amount of various pulls and knobs and handle samples I tried out before I settled on these. It just felt right, and I am so thankful I followed my intuition on this decision. Sometimes it’s easy to feel that every surface and hardware choice has to be trendy and expensive for the space to look complete, but I disagree. Sometimes those elements can be distracting. Most of the wood and ceramic pieces in my kitchen are thrifted, but this cute little tray is from Target (similar HERE) and the wooden spoon is from The Foundry Home Goods. Jeff built the vent hood and I love how it turned out. If you’ve ever shopped for a kitchen stove vent, you probably have learned they are surprisingly expensive! In an effort to save some money, we just used a bathroom fan vented to the outside and built an industrial vent cover ($20 on Amazon - see HERE) into the frame. Not the simplest DIY project ever, but totally doable. The pantry is one of my favorite parts about the kitchen. One third holds our dry goods, snacks, and my rather massive collection of canning jars. The doors in the upper middle section open up and retract back - a feature Woodstock did an amazing job on. That middle section holds small appliances which are already plugged up and ready to use. It’s quite a handy feature and I absolutely love not having appliances out on my countertops. The right section of the pantry holds my pottery, china, and other random decorative pieces. We still need to add some trim to the top of the pantry cabinets and finish up installing quarter round in some places too. I reached out to Hudson Valley Lighting to partner with me on this project because their online lighting selection is incredible. The quality of these lights just blows me away. I could not be more happy with these two pendants over the island. They are statement pieces while still being neutral and simple and a nod to shaker characteristics. I’ve linked to all of the lights and bigger design pieces at the bottom of this blog post. We have had this floor runner for more than two years at this point. I really love it! It’s soft and doesn’t shed like jute rugs tend to. I wish it was just a bit wider in this space, but it’s fine for now. I thought I wanted a vintage runner - and maybe I will get one eventually - but I have really enjoyed the simple, neutral texture in here. I purchased it off Amazon for a great price and it comes in so many different sizes! See it HERE. Jeff built the shelves with IKEA brackets, 1x8 pine boards, and a 1x4 underneath the shelf. He drilled holes in that 1x4 for the shaker pegs. It was another inexpensive yet custom-looking detail we added. These sconces from Hudson Valley Lighting are incredible. So well made and gorgeous! And Jeff was thrilled that they were easy to hang. I’ve linked to these specific ones at the bottom of this post. We used 1x8 shiplap boards for the backsplash. This isn’t the first house we’ve installed a shiplap backsplash in. People always ask us how it holds up, and we’ve had great experience with it! We just use a semi-gloss paint and anything that splashes on it is super easy to wipe off. We spaced out the boards with with tile spacers - if anyone is curious how far apart these are. Our dining room is still in progress. I’ll be rearranging the space and then writing a separate post on that in a while. The Kitchen faucet and water filter faucet are from Kingston Brass. I’ve linked to these specific ones at the bottom of this post. I chose a polished nickel finish, and I am so happy with the look of it! The sink faucet is an element in the kitchen I use multiple times every single day, and it was important to me that it be of high quality. I am so happy with this choice - and the price is amazing too. Soap dish | Wood handle brush | I am obsessed with Young Living’s Thieves soaps! We used Sherwin Williams paint throughout the house. 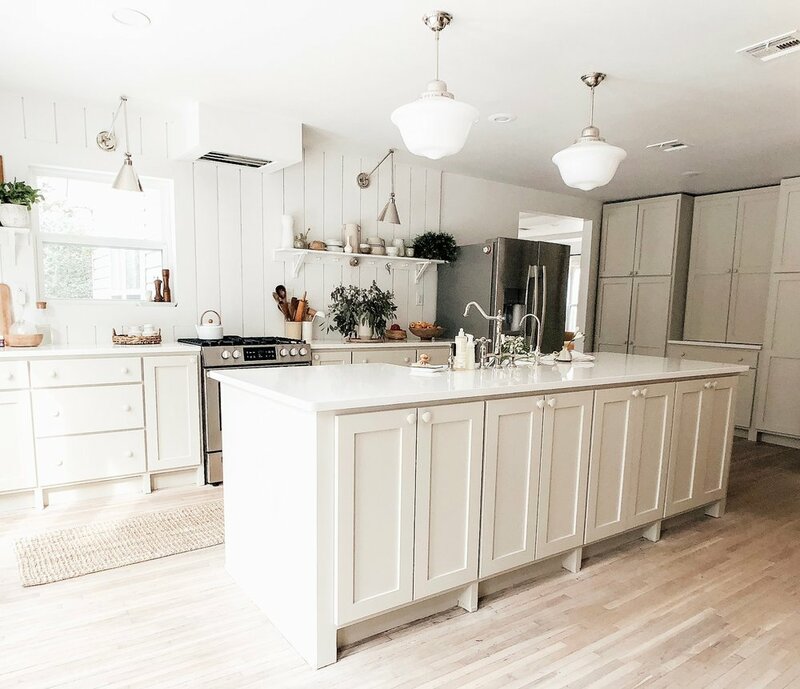 All of the walls and the kitchen shiplap backsplash are painted in “Snowbound.” We’ve used that color in a lot of projects and really love the tone of white. All of the trim throughout the house is Dunn Edwards “Foggy Day” color matched to SW paint. The kitchen cabinets are all painted in Dunn Edwards “Heather” - once again color matched to SW paint.